Create the perfect picnicking, camping, or grilling environment with this heavy duty Lifetime picnic table. Great for family gatherings, cafeterias, camping, break rooms, and more. 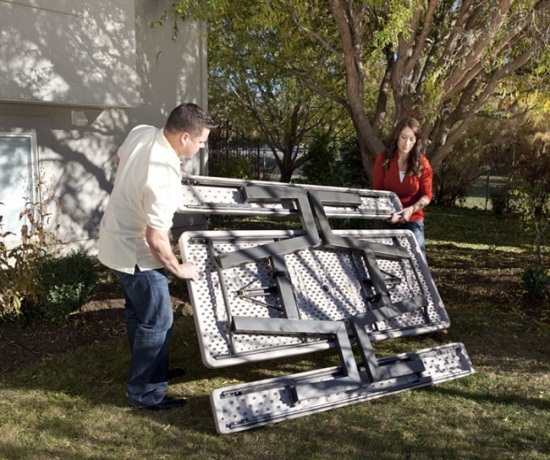 Plus, it stores great for the winter folding up flat for quick and easy storage. 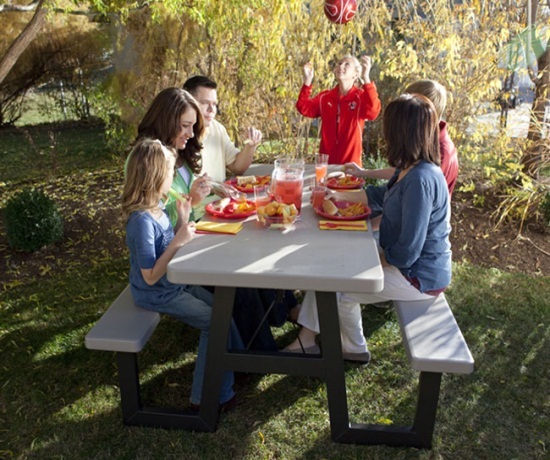 Whether you are hosting your parents or grand kids this durable table will give you years of outdoor fun. With a powder-coated finish designed to prevent rust and a UV resistant table top you can't go wrong. 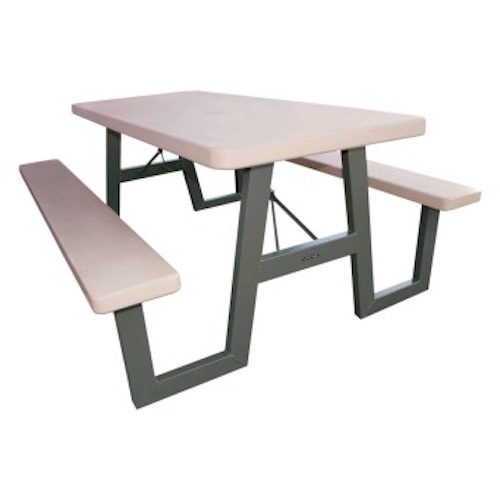 The 60030 picnic table is made from high density plastic with Protestants to prevent fading, peeling, chipping, or cracking. The bronze frame is manufactured using durable steel for constant use. The table top comes with a built-in umbrella hole with a cap for both options. This picnic table comes with a 2-year warranty from Lifetime Products for customers in the United States and Canada. All metal components are powder coated, which helps the metal resist rusting. 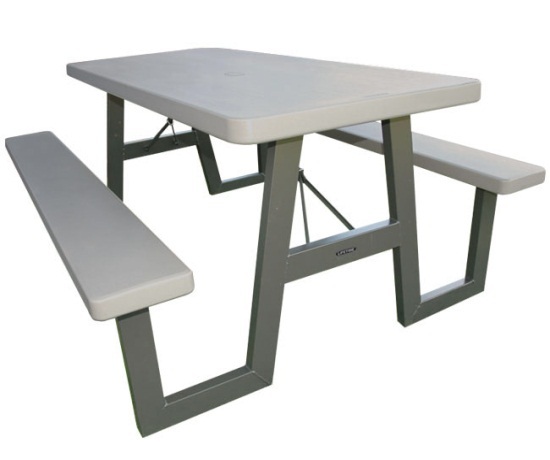 Competitive Edge Products, Inc. is an authorized retailer for the 60030 picnic table. Dimensions 72 inches x 30 inches. built-in Umbrella Hole With Closing Cap. Table top color is putty, which is a gray-brown color. Umbrella hole is 2 inches in diameter. Material of construction: high-density polyethylene (HDPE) plastic. HDPE plastic will not fade, crack, or peel in the sunlight. Great for indoor and outdoor use. HDPE is easily cleaned, typically needs nothing more than soap and water. Does not stain. Cleans Easily. Look Great. Table top thickness: 2 inches. Steel Powder-Coated Frame to Prevent Rust. Frame dimensions: 1.5 inches x 3 inches. Table dimensions unfolded: 72 inches L x 57 inches W x 29 inches H.
Table dimensions folded: 72 inches L x 57 inches W x 4 inches H.
Bench dimensions: 72 inches L x 9 inches W x 19 inches H.
Includes a 2-Year Manufacturer's Warranty. Shipping was fast and I couldn't have asked for a smoother transaction. Thank you again and Happy New Year. The lifetime 6 ft picnic tables were put together without a hitch. Everything arrived as you said it would. Price was fair and customer rep was polite and efficient. Would definitely buy from you again. Can't wait to use the tables this summer. I bought one of these picnic tables last year. Worked out well! I love how it folds flat and fits in my trailer. I cook at several events and these tables are easier to transport than tables and a stack of chairs .. Durable and easy to clean. I love this table and will definitely recommend this to my friends! Q: we need 10 of these ASAP. When would they arrive at zip 24465 ? A: Delivery on larger items usually takes about a week to ten business days. Unfortunately Lifetime does not offer faster shipping. Q: Can this picnic table be left outside all day every day in the hot sun? A: Yes, it is made for the extreme weather, such as the heat of Arizona to the cold temperatures of Alaska. It is designed to be out all year round. It is a good idea to protect it in the winter and to use an umbrella in the summer if it gets too hot, simply so that it does not feel too hot on one's skin. Fast Shipping: Orders for the 60030 Lifetime A-frame Picnic Table generally leave the warehouse the next business day. Delivery Details: This product ships directly from the warehouse in Clearfield, UT. This item ships via FedEx and may not require a signature. Local Pickup Option: This item is available for local pickup in Clearfield, Utah. If you are interested in picking it up locally contact our customer service for a super cheap pickup quote at 866-308-5484. This product has a 30-Day Money Back Guarantee! Dimensions: 72" x 30" x 3"